I believe plants are the most important life forms on earth. They give us the air we breathe, clothes we wear, houses we live in, energy we burn and drugs that cure our diseases or make us feel better. Plants will give us all of these until we last and then outlive us all. Despite all this, we know very little about how they do what they do. Even for the best-studied species, Arabidopsis thaliana (a wild mustard), we know about less than 20% of what its genes do and how or why they do it. We want to uncover the molecular mechanisms underlying adaptive traits in plants to understand how these traits evolved. A bottleneck in achieving our goals is the limited understanding of the functions of most genes in plant genomes. With a sequenced genome as a starting point, we are building genome-wide molecular networks of genes and proteins using a combination of computational and empirical approaches. Using these networks, we want to elucidate functions of uncharacterized genes rapidly and systematically. Ultimately we are interested in finding patterns of network evolution to identify the evolutionary paths of functional innovation for adaptation. * Why are plants so robust to genetic and environmental perturbations and how do they express this resilience? * How is plant metabolism wired and how does it evolve? 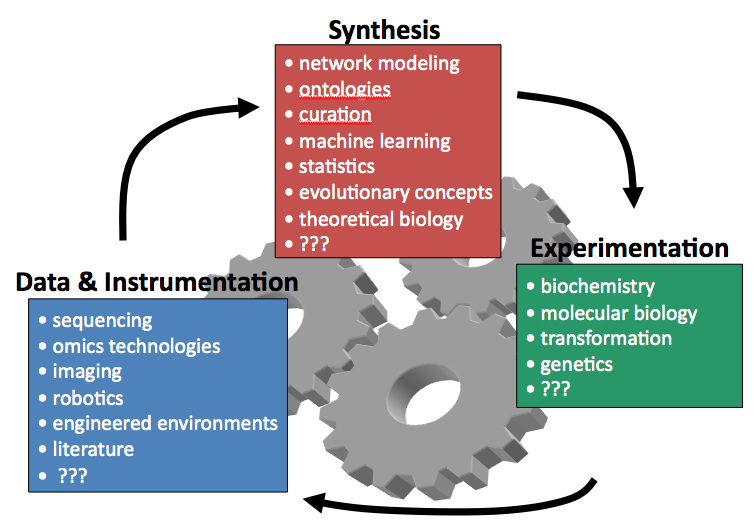 We employ several methods in our quest: 1) combination of computational modeling and targeted experimental testing in the lab; 2) systematic collection of large-scale data needed for the modeling through collaboration with other labs; 3) robust, quantitative analysis of the data and the models. Our work is inherently embedded in collaborations with other labs both at Carnegie and other institutions. This is my vision of our mode of operation. Our own lab is most invested in the synthesis aspect of the ‘research engine’ with a growing component on experimentation. But we collaborate with many excellent labs in all three aspects.